Place 300 g frozen raspberries in a saucepan with 75 g sugar and simmer for 20 min until the mixture thickens. Divide over 4 ovenproof dishes (I can confirm that whisky glasses are not a valid alternative) and refrigerate until cold. You can easily do this a day ahead. 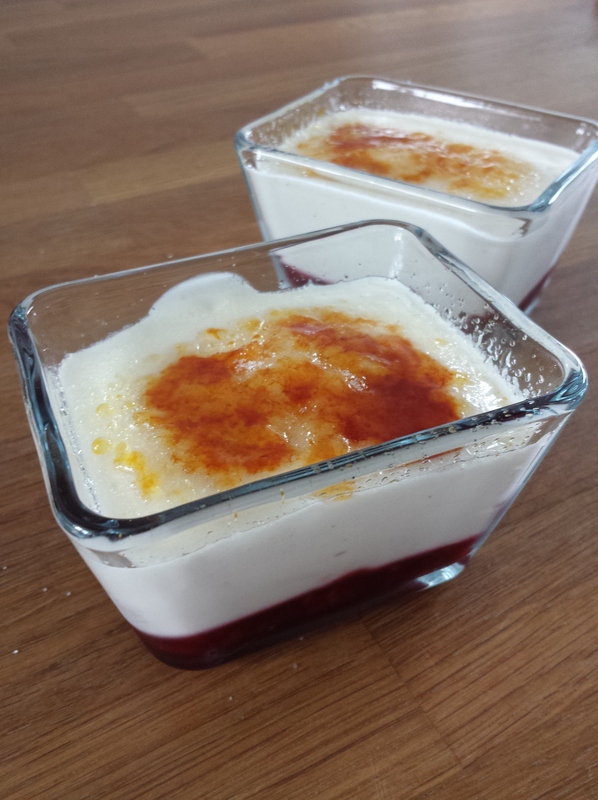 Or if you don’t have time, use raspberry marmelade as an alternative, about 3 tbsp per pot will do. Now whisk 250 g double cream until it starts to hold its shape (it doesn’t need to be completely stiff). Add 420 g Greek-style thick yoghurt, 2 tbsp sugar and 1 tsp vanilla extract and mix again. Spoon over the raspberry mixture and refrigerate until cold (at least 30 min). When ready to serve, sprinkle with sugar and caramelise the sugar with a kitchen blow torch until golden. Enjoy! Preheat the oven to t180 C. Separate 3 eggs (you need 4 eggs in total) and beat the egg whites until really stiff (add a pinch of salt to speed up the process). No need to wash your mixer, you can go straight ahead and start mixing the 3 egg yolks and the left over whole egg together in a separate bowl with 120 g sugar until you get a foamy mousse (about 5 min). Stir in 50 g gluten-free flour, 25 g cornflour and 1/2 tsp bicarbonate of soda (to be replaced by 75 g self-raising flour if you don’t need a gluten-free version), followed by the beaten egg white. Cover a baking sheet with tin foil (fold up the sides of the foil a bit to create an edge) and pour in the mixture (or use a swiss roll tin if you have one). Bake for 10 min until lightly golden and it springs back when you touch it. In the mean time, take another piece of tin foil and sprinkle it with a bit of sugar. Take the bake from the oven and turn it upside down onto the prepared foil. Gently peal of the layer of foil from the bottom. Spread your favourite jam all over (I used home-made forest fruit jam – made from half frozen fruit en half sugar (with pectin) and a squeeze of lemon, just follow the recipe on the sugar packaging if you want to make some), leaving a gap along one of the long edges. Sprinkle with a bit more sugar and start rolling it up from the opposite long edge. Put it on a serving plate with the seam at the bottom and leave to cool completely. If you don’t feel like the extra effort (or sugar level), just dot the roll with some fresh raspberries and you’re done. Or go all the way and make the marshmallow icing by putting 2 egg whites in a heatproof bowl with 115 g golden caster sugar, 1/2 tbsp water and a good pinch of salt. Place over a pan of simmering water, making sure the bowl doesn’t touch the hot water, and whisk until thick and leaving a prominent trail from the beaters (this will take about 4 min). Remove the bowl from the heat and continue whisking for another 3 min until cooled slightly and really stiff. 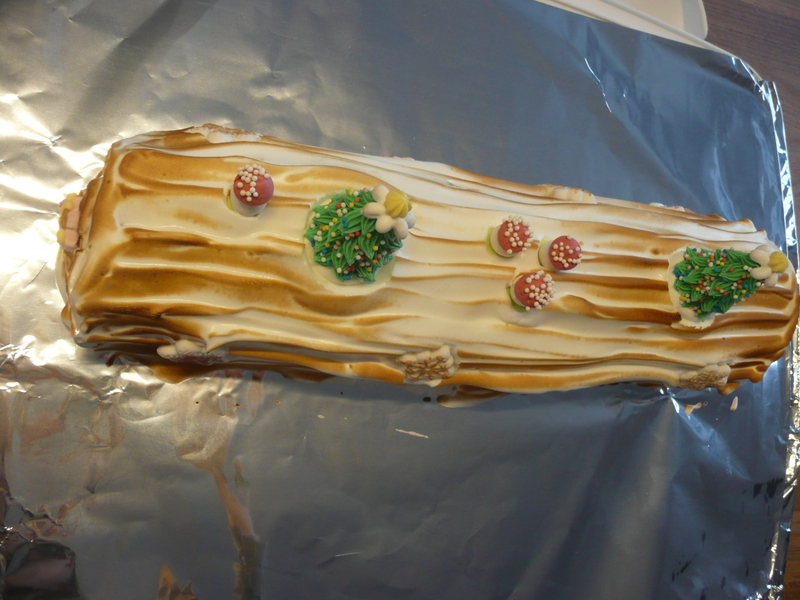 Spread over the swiss roll using a large (palette) knife, you can use the back of a spoon to make a log pattern or just go wild with a piping bag. Use a cook’s blowtorch to toast the meringue to a golden brown (this will go really fast). It’s worth the effort, the toasting makes all the difference! Decorate any way you want and enjoy! Cut 2 mangos in chunks, add 150 g icing sugar, the juice of 2 limes and the crushed seeds of 5 cardamom pods (optional of course, you can just leave them out or add any flavour you prefer with mango, such as mint leaves for example) and mix to make a smooth puree (you can also do this in a food processor of course). Transfer to an ice cream maker and churn to freeze according to the instructions of the manufacturer (it only took 20 min in my kitchen aid bowl). Transfer to a container and put in the freezer until you are ready to eat it. That’s it! Don’t have an ice cream maker or the patience to freeze this stuff for a couple of hours? 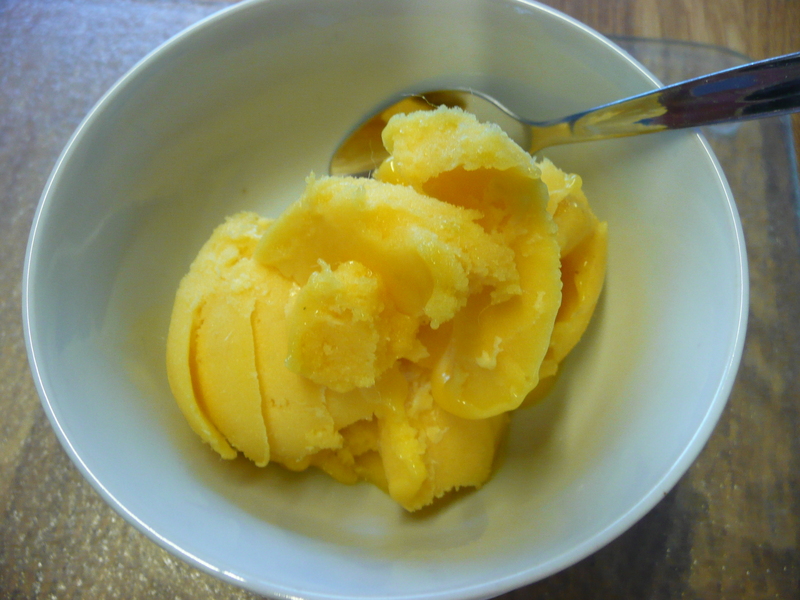 You can also use a short cut: just buy frozen mango in the supermarket and take it out of the freezer 10-15 min before you want to eat your sorbet. Mix it and serve: you now have a 100% fruit sorbet that is good for you and your diet! If you want you can add some sugar, lime juice … but you will notice it doesn’t need it. 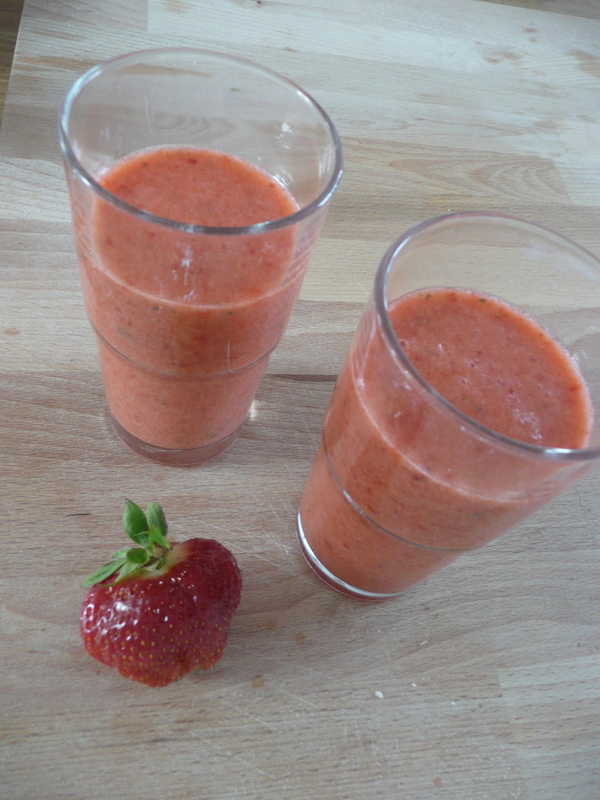 This also works with any other type of frozen fruit, such as forest fruit or raspberries. Enjoy! Boil 200 ml water with 75 g sugar and stir until all the sugar has dissolved. Add the grated zest and juice of 1 lemon, 2 tbsp tequila and 2 g salt (you really taste the salt, so stick to 1 g if you only want a subtle hint) an stir everything together. 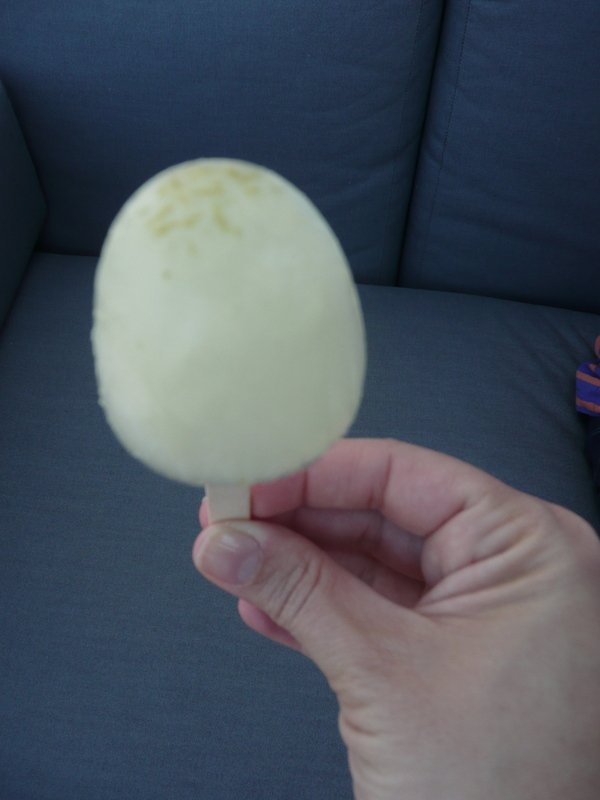 Transfer to ice lolly moulds and allow to freeze overnight. If you want, add some chopped mint to the mix for added freshness. 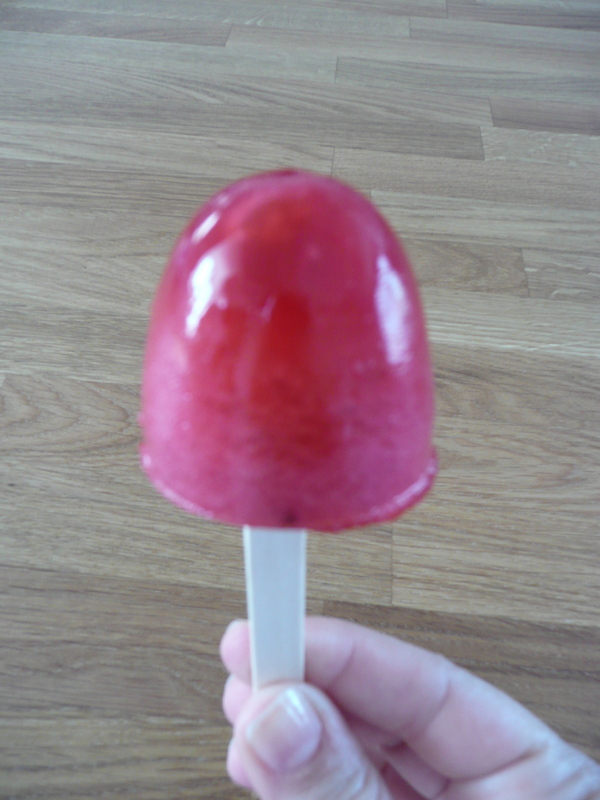 For the kids, you can make a redcurrant ice lolly as well (photo on the right). Just pop 100 g redcurrants in a blender with 100 ml water and 40 g icing sugar. Blend and pour into moulds (if you don’t have a blender, use a hand mixer instead). To unmould, just hold it under lukewarm runny water and it will pop out. Enjoy! 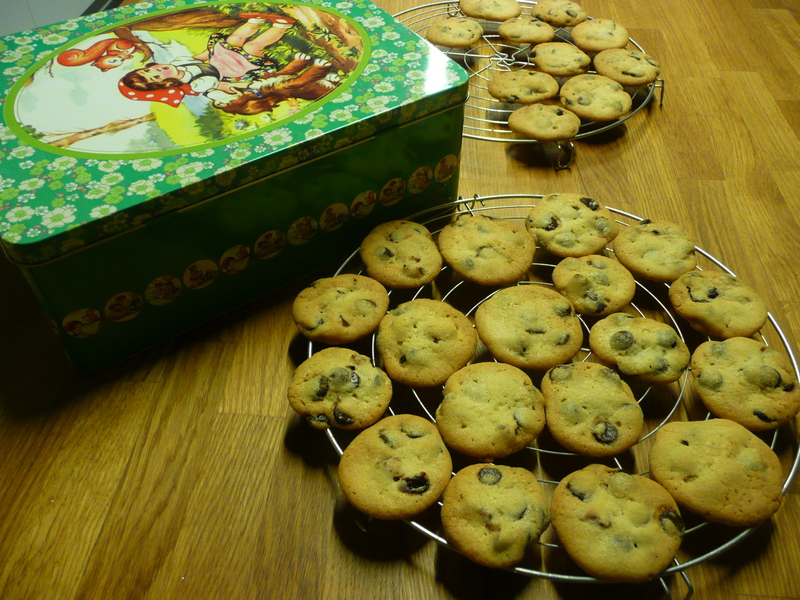 I was always bringing left-over cookies and cakes to work and my colleagues said they looked very professional and I should start blogging about it, so I did. 2. What is your favourite food memory? My mothers bavarois for my birthday. 3. What is your favourite food restaurant & why? I like trying out different restaurants every now and then, and moving to a new city means lots of new addresses to try! 4. Who influenced your style of cooking? Mainly my parents, although my brother, sister and I all ended up cooking very differently with the same upbringing. I’m a fan of Rick Stein and Donna Hay too. 5. What is your favourite food dish, on your blog or not & why? My birthday dinner (the day I can totally choose what to eat) is always the same: spinach and mash fish pie followed by bavarois! I love lots of colours… white (if that is a colour), blue, green and of course pink. 7. What do you prefer: cooking or baking? 8. What is the most lovely & cool cookie cutter you have in your possession? I have a ampfelmann cookie cutter from Berlin, so cool! 9. What is your favourite food destination in the world & why? Difficult choice between Thailand and India, but I’ll go for Thailand. I just love coriander and ginger. 10. On what kind of music do you cook on? Party music! Nothing like shaking your bootie when cutting or stirring food. Cut about 250 g strawberries and put them in a blender with the juice of 2 limes, a small handful of fresh mint leaves and half a can of Canada Dry. Blend and pour into glasses (you’ll get 2-3 glasses from this). Do give it a try, the Canada Dry makes it really fresh and it becomes sort of a cross between a smoothie and a lemonade. Of course it’s best to do this with fruit that comes from the fridge for extra freshness. Enjoy! Poach 500 g rhubarb in 400 ml water with 100 g sugar until soft (about 15 min). Meanwhile, soak 4 gelatine sheets in cold water to soften them. Strain the rhubarb liquid off into a jug and keep some of the rhubarb for serving. Stir in the softened gelatine sheets and 4 tbsp vodka and pour into 4 glasses. Chill until set. Decorate with poached rhubarb. Enjoy! Use up leftover rhubarb in rhubarb crumble muffins. Like jellies? 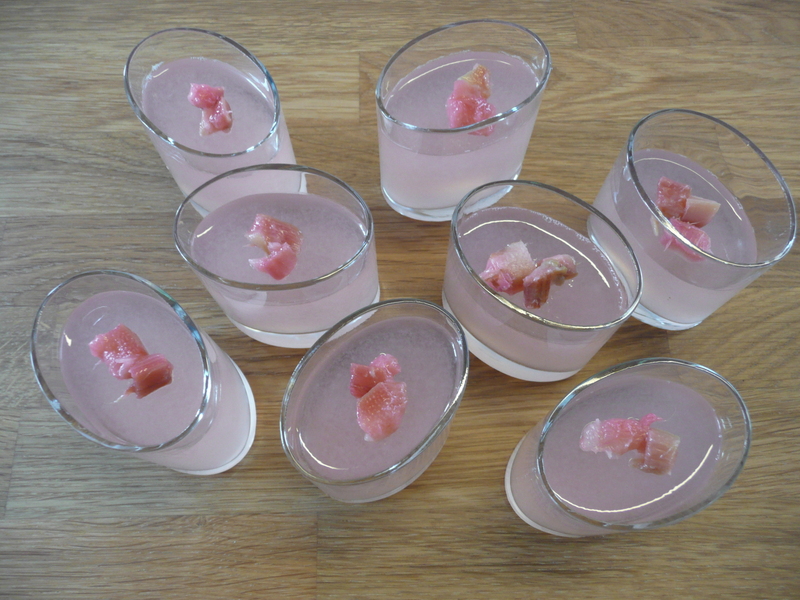 Try some watermelon jellies as well.